Sometimes as I sit down to write this blog all I can think is ‘wow.’ That is what I thought when I watched and re-watched Jodie Foster’s brilliant acceptance speech for the Cecil B. DeMille Award for lifetime achievement at the Golden Globes a few years back and I knew I had to write about it. In my opinion her speech was heartfelt, direct, honest and classy. If you didn’t see her acceptance speech here is a link to it. Please let me know what you think of it in the comments below. The most important thing Jodie did in her speech was come out in her own way. Her own way is the crucial statement there. There is no one right way to come out as LGBT. I’ve read a handful of blogs, viewed comments and have seen many Tweets about this and I’ve read points of view that applaud Jodie for coming out in a grand way. I’ve also read points that tear her apart for not having done it publicly sooner. Many of us already knew that she was a lesbian. In 2007 she thanked her then partner Cydney in an acceptance speech. There could have been an earlier time but this is the first time I am aware of. So why are some in the LGBT community coming down so hard on Jodie for coming out now? I read one interesting article that was written by a woman who is roughly the same age as Jodie and she came out as a lesbian 20 years ago. Her primary point of view was that it was 2013 and many actors and actresses had come out, so she should have no excuse for not having come out already. Let’s keep in mind that Jodie had publicly thanked her ex Cydney in other acceptance speeches. It’s not every day you are awarded with the lifetime achievement award at the Golden Globes which provides an opportunity to come out on a massive scale. What I don’t understand is why is there such a lack of compassion for her? Is it because she is a celebrity and she’s expected to be super human? 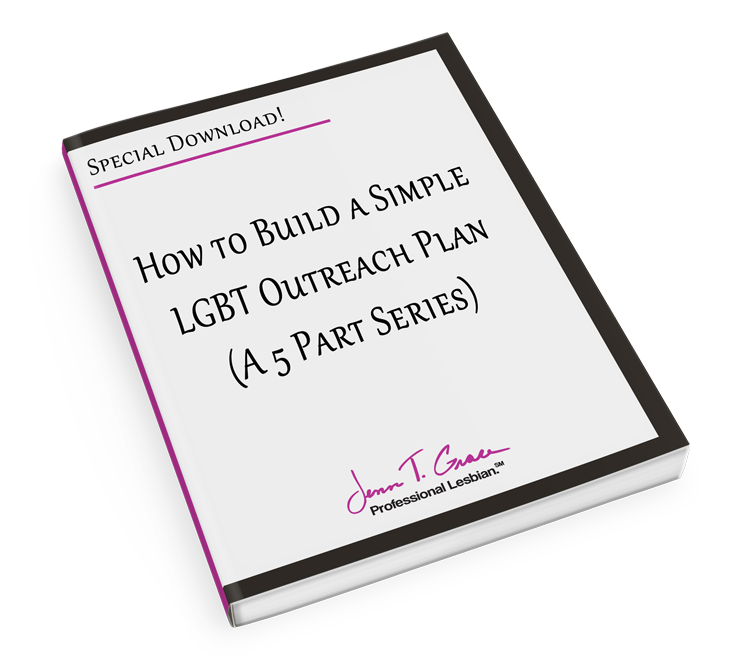 If you are part of the LGBT community chances are you’ve come out at least a dozen times, if not hundreds of times or even on a daily basis. Have we forgotten how much courage and inner strength it takes to announce to someone that you are LGBT? How many of us are in Jodie’s shoes? The shoes that have spent 47 years in the public eye and have tried as hard as possible to keep a level of privacy to live a somewhat ‘normal’ life. I’ve come out countless times and continue to each and every day. Sometimes it’s easy, sometimes it’s not. Even for someone like myself who passionately advocates on behalf of the community every single day, I find myself in situations where it doesn’t come easy to come out. If that’s the case for me I cannot even possibly imagine putting myself in Jodie’s shoes. She could have accepted the lifetime achievement award without mentioning anything about this. She was clearly going off script and yes it came out a somewhat jumbled mess. She was nervous and rightfully so. She had an opportunity to come out in the biggest possible way and she took it without giving herself much time to think it through. For those of you who are LGBT and reading this – imagine yourself coming out in front of millions of people. You know when you do there will be mixed reactions – some who will be pro-Jodie/LGBT and some who will be anti-Jodie/LGBT. It doesn’t matter if it was 2013 – it was her journey and she had the right to come out when and if the time was right. The night of the Golden Globes was the right time for her. So why rip each other apart? Perhaps I’m just naive but in my opinion the way to get mainstream LGBT acceptance is by supporting our fellow members of the LGBT community, not tearing them down because they didn’t come out sooner like you did. Everybody’s circumstance is different so why not just support the fact that she did it and be happy that the LGBT community is gaining more visibility. 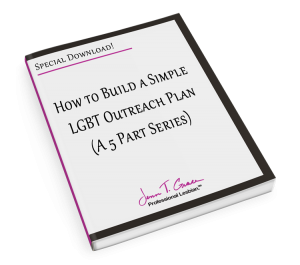 I (as I’m sure some of you have) had an opportunity to come out to someone and I didn’t – do you know what happens when you miss that window of opportunity? You never get the same one again. If you miss it, it becomes awkward or the person on the other end feels slighted, hurt or upset that you didn’t tell them sooner. That’s the challenge with coming out…. when is the right time? 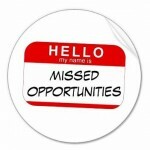 Click here to read the missed opportunity I had. Side note: I received several messages from people judging me based on this experience. What good does that do anybody? None. I’m going to give you a real life example of one of my coming out experiences in the workplace. This was from about 9 years ago. I’ve been a ‘professional lesbian’ as I like to call it for about 6 years so this was prior to that. This was my first job in an office setting, prior to this I was in retail management. I’m a hard worker and my mindset at the time was get in, get the job done well and get out. My cubicle had been positioned next to a woman who was roughly the same age. Due to our proximity together we naturally started talking about things unrelated to work. At this time I was in a pretty serious relationship. One that had uprooted me from where I was in Massachusetts to living in Connecticut with her. One day during conversation this person made an assumption – and this is where it always goes south – that I had a boyfriend. In that split second of someone assuming boyfriend instead of girlfriend you need to decide do I come out or do I not come out? It’s like the fight or flight feeling. Having been at this job for about a month and not really knowing the cultural of the company yet in that split second I decided not to. Instead I engaged in what I call the pronoun game. Rather than ever saying she, you switch things up to say us, we, they, them, etc. It avoids you from having to come out but also avoids you from having to bold face lie and say he when you really mean she. Long story short I was with someone at the time who had a name that could be either male or female, you know names like Jo, Chris, Jamie, etc. So I was able to say her actual name and not be outing myself. But the problem was that we had really started to bond and grow close as friends and now I was at a point where I felt like a horrible person for not having told her sooner. I so badly wanted to come out to her but I didn’t know how. Why? Because we had passed that magical threshold, which seems different in every situation. We were now more than office mates we were friends and I was hiding this big secret from her. Had I known from the start that we were going to be friends I would have been honest with her from the get-go but I didn’t know that so I chose to play it safe and keep my cards close to my vest. I don’t remember how many weeks or months it had been before I finally did come out to her but it was tough. I knew her well enough to know that she wouldn’t care at all. That wasn’t my concern. My concern was that I was going to hurt her for not having said it to her sooner. This is a dilemma that LGBT people face all of the time. I am fortunate enough to work within the LGBT space on a daily basis so if I haven’t already mentioned my wife in conversation it’s typically assumed that I am a lesbian. I am in a unique position because I don’t have to come out nearly as much as the next person. But for other LGBT people in the workplace or in business settings, unless you have a name tag that says “Hi, my name is Jenn and I’m a lesbian” people don’t know and it’s your responsibility to come out to them. It can be emotionally exhausting. Replay my earlier real life example over and over for every time someone has to come out in the workplace. If you switch departments – bam, time to come out. 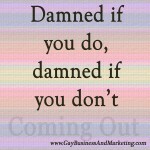 You switch employers – bam, time to come out. You are attending a networking event for the first time – bam, time to come out. It’s an ongoing thing. 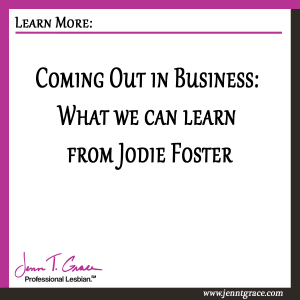 You can chose whether or not you want to come out in the workplace or in business settings. But to me it’s all about being your true authentic and genuine self – there’s no better way to embody that than by being transparent with those around you. Studies show that happier employees make more productive employees. LGBT employees are happier when they are able to be out at work and are able to bring their whole selves to work. So if you are a business owner or an employer with staff – think about the above outlined scenario. Think of how much time and energy I probably wasted trying to hide my identity while I was on the clock.  Had I felt, believed or been told that this company was LGBT friendly I could have come out on day one and never looked back. But that wasn’t the case with this company and it may not be the case with your company. You need to look at the inside structure of your company and see if you embrace diversity. 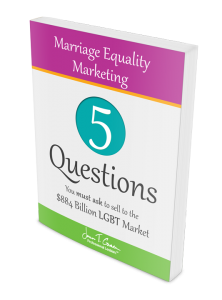 If you don’t there are many good reasons why you should and why it’s good for business. (That’s a blog post for another day.) Feel free to take a look at this past post about the steps of internally communicating to your employees. ← What the heck is a Chamber of Commerce? “That’s nice, I’m straight. Now, is there a point to this conversation?” Why is it so important to come out? 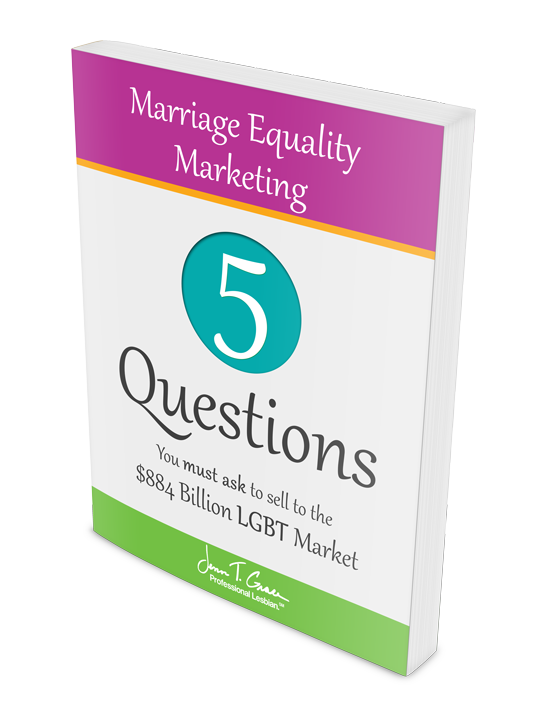 Hi Laura – thanks for taking the time to respond to this blog post, I do appreciate it. Based on your response to the co-worker who confided in you, it would strike me that you are more of an open-minded person. 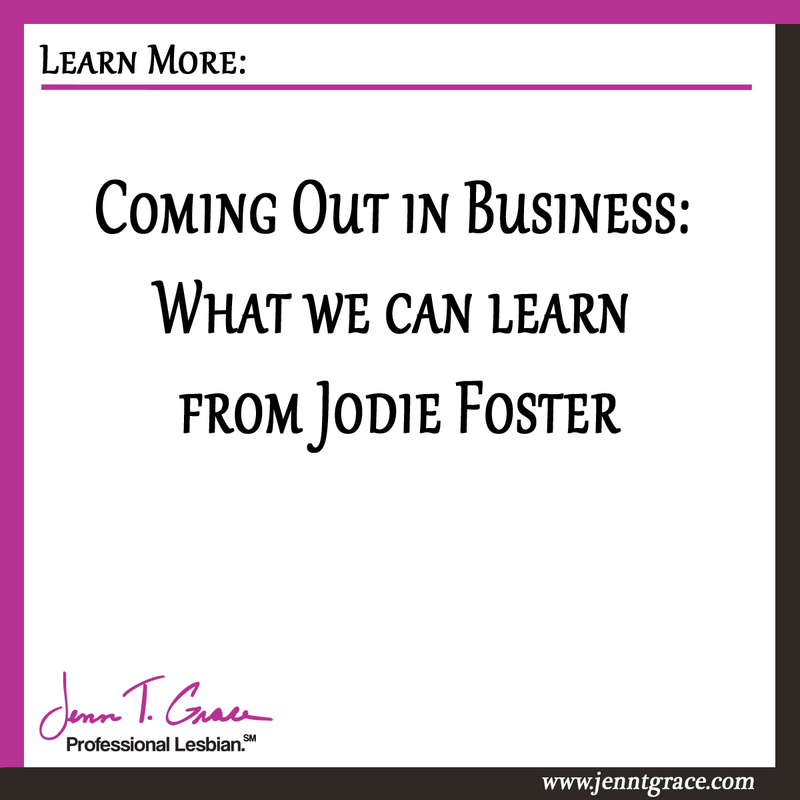 For people like yourself coming out in the workplace doesn’t seem like a big deal because you are accepting of it and quite frankly you don’t believe it is a big deal or needs to be a point of discussion. In an ideal world your co-worker could just be himself and be gay without it requiring a dreaded coming out process to you. He swore you to secrecy before actually outing himself and it probably took him a while to come to terms with telling you. He was able to confide in you because he wasn’t fearing your reaction. It was important for him to come out to you because it was likely eating away at him. Creating a relationship with you he likely felt like he was hiding something from you. He wanted you to know and it took a lot of courage for him to tell you. When someone has a secret that they are hiding from those who they work closely with it lowers productivity levels because the person is spending time worrying about being found out and not on the job at hand. I can understand your comparison to religion in the sense that at the end of the day it’s not my business in the workplace what your religion is. I do not have any right to criticize you based upon that. It should be the same for sexuality as well but often people find that it’s perfectly fine to criticize another based on sexuality. I’m certain it happens with religion as well but I don’t know enough about religion in the workplace to properly comment on that. Does that help in anyway? It’s somewhat tough to explain but I hope this helps. Enjoyed this thoughtful & insightful post. You made a good point that judging and criticizing someone else’s coming out process doesn’t help ANYONE. I had a therapist friend make a comment to me years ago that those people who criticize and are unhelpful/unsupportive is due to THEIR own emotional state about the topic & the situation simply triggers something within them. This is a very simplistic explanation, but it reminds me to be compassionate with others about when they’ve chosen to simply react instead of responding. Thank you for being a powerful voice for support of Jodie Foster and others in the LGBT community who need to come out in their own way. Hi Patricia – thank you for the nice comments. The response I’ve been getting from this blog post has been similar to your thoughts on it. We need to respect everyone and let them do it on their own terms whether they are a celebrity or not.